'Moving Cities: Athens’ dancers deliver timely testimony to Greek endurance. Taking to the streets and working with the natural hustle and bustle in cities around the world, Chowdhury’s latest film ‘Moving Athens’ pairs together dance, music and film into one striking piece of art. His stories rely on capturing improvised and raw moments in time while weaving them together into one tapestry of sight and sound. The timing couldn’t have been better. With youth unemployment rates in Greece hovering just below 50 percent, ‘Moving Athens’ is a testimony to the power of dance. Set against a backdrop of urban decay as well as architectural durability, young dancers improvise across a range of dance genres, from ballet to street. 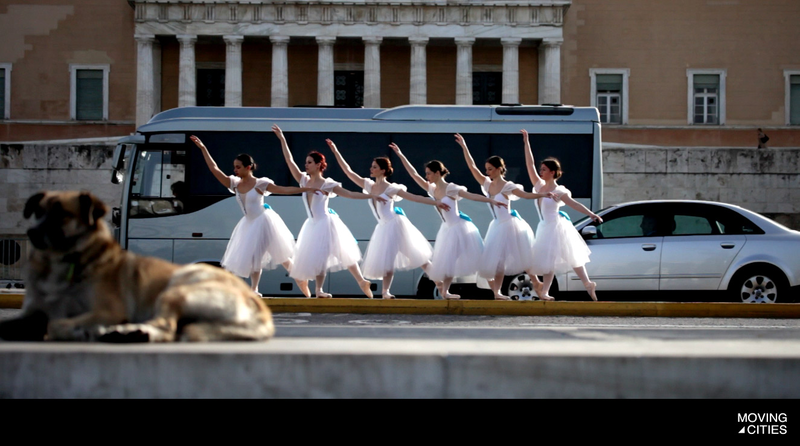 Their movements synchronise with and are a counterpoint to the traffic that continues to speed across the city, evidence that despite the challenges, life in Athens continues at a pace. While there is a poignancy in their movements, the filmic dance express an optimism in its measured steps and interventions. ‘Moving Athens’ is sixth in an award-winning collection of works by the London-based film-maker to capture the world as a stage. Life on the street in London, Paris, Brussels, Prague and Yerevan in Armenia, which took Chowdhury back to his roots, have all been recorded in this growing canon. Together, they have garnered 10 international prizes from film festivals around the world.